Happy Friday! I'm calling this beauty up above, 'The Last Peony', because that's what it is. I had a great run for nearly a month, with my runaway blooming peony push, and this is the last hurrah. I wish wish wish that peonies were like roses, and would keep repeat blooming all summer long, but then I guess they wouldn't be as special. Every year it's the same gasp of delight when the first peony blooms and a sad sigh when the last flower is done working its magic. 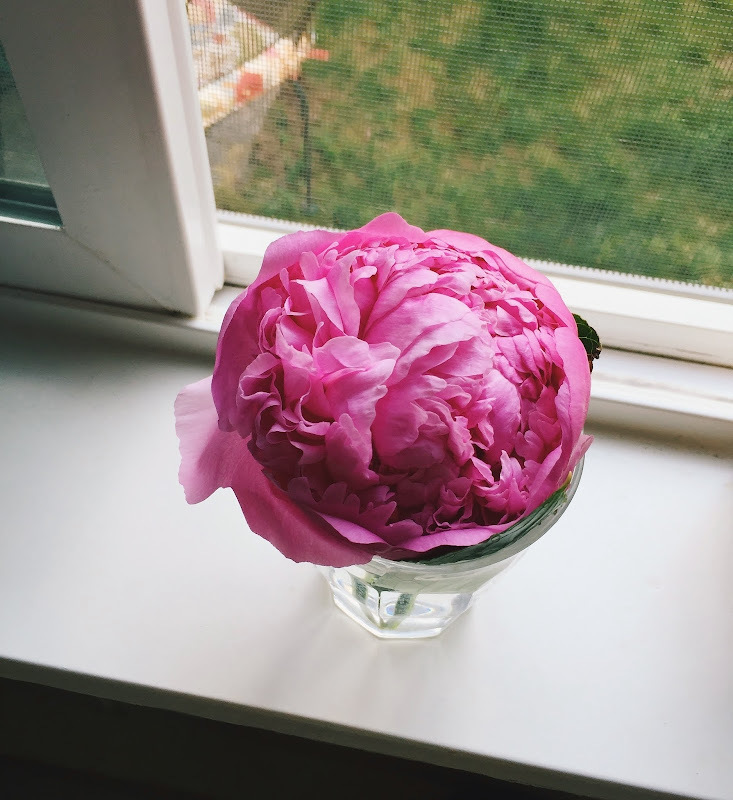 My husband informed me that he doesn't particularly care for the smell of peonies. I told him what I always say when someone doesn't agree with me - That's crazy! The smell of a peony is one of the best smells on earth. This is also the man who told me that my favorite Christmas fragrance oil smells like cat pee. THAT'S CRAZY. Julia just watched this classic summer camp film for the first time and loved it. MOST EXCITING INFO OF THE WEEK. An American Hogwarts!! Best of kids' rooms roundup on Design Sponge. Look at this teeny tiny cottage! Making this recipe very soon. Wonder how much/if the child+husband will complain. Fascinating - more to add to our recent 'Alice' conversation. Lewis Carroll's portraiture. I want a camper with all of my being. Why yes, I AM following Chris Pratt on Instagram. Because of this. Cool Book of the Week: Sometimes I am so tremendously sad that Julia is pretty much past the picturebook age. 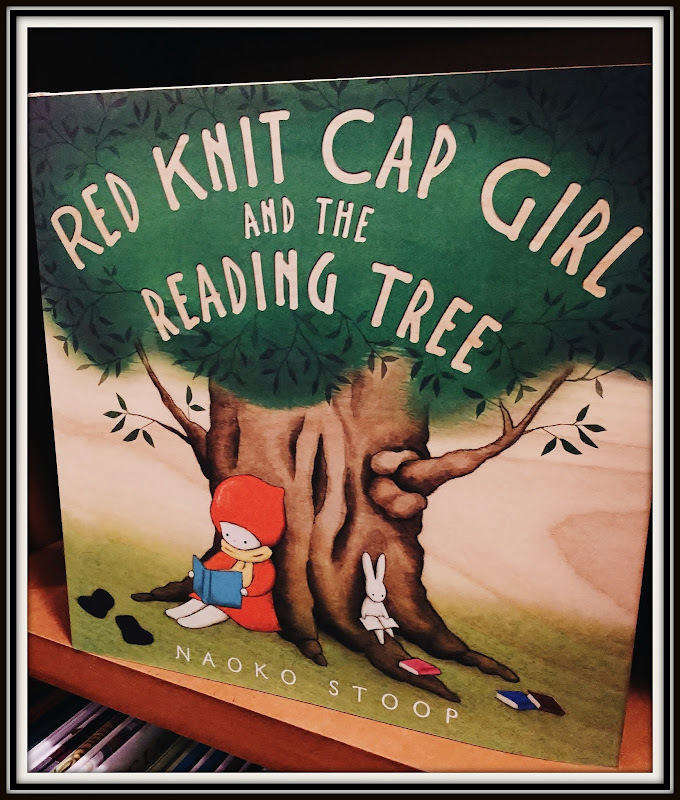 I've been hankering after 'Red Knit Cap Girl' by Naoko Stoop for a long time, and I recently passed the newest book in the series, 'Red Knit Cap Girl and the Reading Tree'. So precious! The gist is that a little girl discovers a hollow tree and she and her forest friends puzzle over what to put inside it. The girl decides she will store her books inside, while her friends bring more books, as well as other items like blankets - and one enterprising fellow creates a wee bookshelf. By the end of the story, the Red Knit Cap Girl realizes that they've created a little library and explains what that is to her animal friends. DARLING. Have a lovely weekend! As always, if you'd care to share what you're eating, watching, or reading, I'd be most appreciative. Has anyone watched this show? Do I need to start it asap? I've heard it's fantastic. I love the Red Knit Cap Girl books. So pretty! Big Sis keeps rewatching Parks and Rec, and we also saw Guardians of the Galaxy this week - FINALLY - so Chris Pratt has been a constant in our house. Julia wants a groot too and she hasn't even seen the movie!! YES to that wacky plot in Parent Trap - I was thinking the same thing - HOW would that have ever ever happened?? Here have a kid and I'll never see the other one again? WHAT? My daughter is almost 21-and I love the wisdom of the mom saying she doesn't understand a lot of the decisions her kids make. It is funny, you do your best to raise your child to make their own decisions, but sometimes it is hard to let things go and not chime in. She is definitely a wise person. Chris Pratt...I could go on and on. I have loved him every since Everwood-have you seen it? If not, please try to see it. Such a lovely show. Parks and Rec is one of my favorite shows ever-and it thrills me that he is doing so well. You know, I never saw Everwood - not sure why because it seems like the type of thing that would have been right up my alley! Parks & Rec was seriously my most favorite show ever and we don't have cable, so we watched it all on Netflix and oh happy day, I still have more of it to look forward to when that last season hits netflix!! Seriously. I haven't been a fan of an actor in ages and ages and ages - and I am a HUGE MEGA FAN of this guy. Me too! I feel like a proud mommy that he's doing so well! you're a naughty girl! ha ha ha! i want to enroll at US Hogwarts.